I start boiling the noodles in water with some butter and salt first (Very important). Then I start mixing the Ricotta Cheese ( the whole container) with the Tomatoes, diced onion and egg. Once you dice and get everything ready the noodles will be just about ready to drain and add cold water into the pan to cool them. Drain again and spray your glass oven pan. Place a layer of noodles, add some of the ricotta mixture and spread out. Add meat and then sprinkle the shredded cheeses. Then add another noodles layer and repeat, mixture, meat cheese until all of the noodles and fixings are used up. 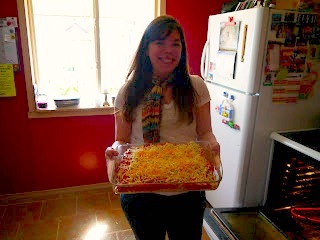 Sprinkle the shredded cheese on top as shown above. Bake for about 30-45 minutes at 365. I eye bawled it to be done when the cheese was melted and starting to brown (in the picture it looks burnt but it's just dark brown). Cut and enjoy!